GSC Agribusiness is the Livestock Production and Management arm of parent company GSC Financial, based out of Atlanta, Georgia. In August 2012, GSC Financial entered into an agreement to operate and manage the Feed and Livestock assets of Juergens Produce and Feed, as a way to more vertically integrate their business model. The Iowa operation brought nearly 100 combined years of production and management experience to the GSC portfolio. We currently employ a staff of 100 full time employees plus 35 outside contract employees. In today’s fast paced business world, GSC Agribusiness strives to be a leader in not only production but also innovation. With Gross Sales topping 70 million dollars annually, our management team’s prudent financial management has resulted in powerful resilience and staying power throughout times of adversity, and exponential, well-designed growth. GSC Agribusiness prides itself on being an industry leader in both livestock management, and manufacturing capabilities. Our production team oversees 8500 head of breeding stock, including all the production from those animals. Annually, we market 200,000 plus animals in a 3 state trade area. 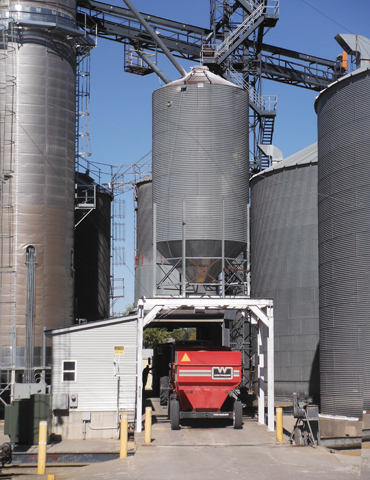 GSC Ag., a subsidiary of GSC Agribusiness, manufactures and delivers 100,000 ton annually within a 60 mile radius of our milling facility in Carroll. We source and haul all of our own ingredients, as well as move animals within all stages of production. We manage the logistics of 10 trucks, coordinating between livestock and ingredient hauling to maximize profit potential. GSC Ag also fully staffs an accounting and financial department for GSC Land, consisting of 9400 acres of irrigated crop land, timber, and pasture located in South Georgia. We also manage the day to day finances of GSC Cattle, with potential capacity of 20,000 head in both Nebraska and Georgia. GSC Agribusiness looks to continue and strengthen their position as an industry leader, in Swine Nutrition and Management, Feed Manufacturing, Cattle Production, as well as Land Development.